MobiLift™ scissor lift tables are rugged industrial lift tables with push-bars and casters. 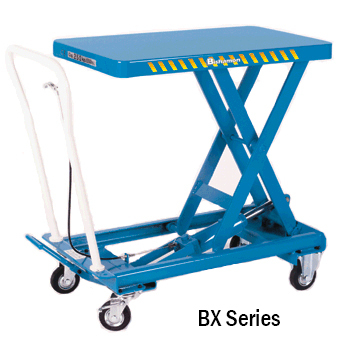 BX Series lift tables provide improved ergonomics by placing the load at a convenient work height while providing the mobility to locate the lift where it is needed. MobiLift™ tables are available in various capacities and travels to satisfy a wide variety of applications. The manual foot pump models have an integrated hydraulic pump/cylinder assembly while a 24-volt DC power unit provides the lifting power on electric battery powered BXB. The MobiLift™ scissor lift tables add the value of mobility to the hydraulic lift table concept. Exceptional functionality and maneuverability is apparent, whether loaded or empty. In addition, rugged construction and premium-quality hydraulics complement their ease of use with low maintenance. The MobiLift™ design allows workers to easily move and position loads to a convenient working height. By minimizing undesirable lifting, reaching and stretching, MobiLifts increase productivity and decrease workplace injuries. MobiLift™ tables are used in a wide variety of applications. From stocking shelves in retail stores to lifting and moving materials in libraries, nurseries, machine shops and manufacturing operations, MobiLifts improve productivity. Num. of Strokes – 15 20.4″ 8.4″ / 28.8″ 17.7W x 27.6L 17.7″W x 33.6″L x 31.3″H 330 lbs. 75 lbs. Num. of Strokes – 50 22.1″ 17.2″ / 39.3″ 20.4W x 39.8L 20.5″W x 46.9″L x 37.8″H 1100 lbs. 300 lbs. Num. of Strokes – 67 22.1″ 17.2″ / 39.3″ 20.4W x 39.8L 20.5″W x 49.5″L x 37.8″H 1760 lbs. 300 lbs. Num. of Strokes – 64 45.1″ 17.0″ / 62.1″ 20.4″W x 39.8″L 20.5″W x 49.5″L x 37.8″H 660 lbs. 340 lbs. Num. of Strokes – 66 23.0″ 16.5″ / 39.5″ 18.1″W x 25.6″L 18.1″W x 37.2″L x 37.0″H 1100 lbs. 275 lbs. Num. of Strokes – 90 45.1″ 17.0″ / 62.1″ 20.4″W x 39.8″L 20.5″W x 49.5″L x 37.8″H 1100 lbs. 380 lbs. Lift Time to Max. Height – 10 sec. 23.1″ 17.2″ / 40.4″ 20.5″W x 39.8″L 20.4″W x 50.0″L x 37.4″H 1100 lbs. 390 lbs. Lift Time to Max. Height – 10 sec. 39.0″ 15.2″ / 54.1″ 19.7″W x 32.1″L 19.7″W x 39.7″L x 35.4″H 330 lbs. 330 lbs. Lift Time to Max. Height – 12 sec. 46.3″ 17.5″ / 63.8″ 20.5″W x 39.8″L 20.4″W x 50.0″L x 37.4″H 660 lbs. 450 lbs. Lift Time to Max. Height – 17 sec. 46.1″ 17.1″ / 63.2″ 20.5″W x 39.8″L 20.4″W x 50.0″L x 37.4″H 1100 lbs. 490 lbs.